The pound looked like it might break out against the yen yesterday but some soft details in the second reading on Q1 GDP hit the UK currency. Meanwhile, the yen was bid up quickly under mysterious circumstances in Asia and has maintained most of the gains. Technically, the pair pressed up against the April and late-March highs before today's selling. In the bigger picture, today's 100 pip decline still pales in comparison to the 400-pip rally on Tues-Wed.
A continued slide would emphasis the recent range but there has been a steady stream of higher highs. Combine that with a likely 'remain' vote and Japan's will to weaken the yen, and you have a more-convincing case to the upside. 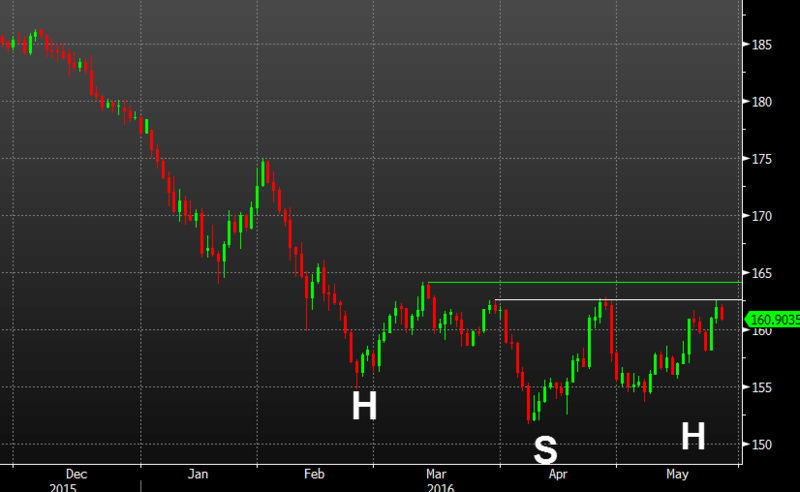 On the chart, there is an inverted head and shoulders pattern shaping up. If the 162.58 level breaks, perhaps with confirmation of a break of 164.10, this pair could easily rally back to the Feb highs near 175. I like longs from 160.00.